Carp Fishing Science is almost 300 pages long and includes more than a hundred photographs and diagrams. 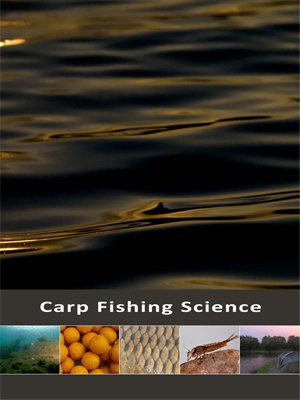 The book summarizes and distills more than two hundred and fifty published scientific papers and books concerning areas of carp biology and nutrition, feeding and environmental biology. The author has simplified the information in order to provide an easily understandable text. This kind of book has never been written about carp fishing and should become a source of reference and discussion among carp fishermen for years to come. "Compared to when the author first started fishing for carp in the 1970's, there exists today an overwhelming diversity of techniques, baits and ingredients. Up until now nobody has explained how these relate to the biology of the fish and its environment and how the angler can make decisions to best effect considering the scientific aspects of carp fishing. This book gives a clear interpretation of these and will result in a more confident approach to carp angling." "If the reader is expecting tales of adventures with monster carp in exclusive waters, then this book will be a disappointment to them. So too may be the fact that I am neither a well-known specimen hunter nor do I have my own brand of fishing tackle." "My views are based purely on my long experience in the field of fish biology and the aquatic environment and extensive research into the carp itself, and I have presented my findings in a straightforward and easy to understand manner with the objective of improving the watercraft and catch success of any level of angler." Born in Manchester, England, Jon Wood has been a fisherman since the age of seven. Having been first introduced to rod and line by his uncle, Jon has fished for a variety of species in fresh and seawater on several continents, with most his time having been spent angling for carp or fly-fishing for trout and salmon. After graduating in marine biology at Heriot-Watt University in Edinburgh, he completed his master’s degree in aquaculture at the University of Stirling, before moving to Chile to work in the salmon-farming industry. Following three years as an employee, he set up his own environmental consultancy company, providing services to the aquaculture farms and hatcheries of the country, and has applied his knowledge of water and sediment quality to monitoring studies and environmental impact assessments since 1997. During his time in Chile, Jon has written two fictional novels and has made numerous contributions to the country’s aquaculture press. However, he has never lost touch with his hobby, and this is his first publication dedicated to his real passion. In Carp Fishing Science, he applies his extensive experience of the aquatic environment and the fish itself, to an area of angling which has developed from simple beginnings into a highly technological and scientific pursuit.